In sharing our love of this land, we hope to innspire our guests to pause, to breathe deeply of the spiritually charged air of Safed, experience the heartbeat of Eretz Yisrael, rekindle ancient wisdom. At the Way Inn we aspire to create a sanctuary, a place to nourish body and spirit with accommodations that blend the aesthetics of a boutique hotel and the intimacy of a luxury Bed & Breakfast, family-run zimmer. not just visiting Tsfat, but innhabiting it. We arrived in Safed as the final stop on a spiritual journey that took us through India, the Far East, South America and California. I, Gita Zohara (nee Genine Lederberger), grew up in New York City, a child of Orthodox Holocaust refugees from Europe. While strongly committed to Judaism, I studied many wisdom traditions seeking to comprehend the nature of a world of such light and darkness, so much joy and sorrow; hoping to rebuild my trust in the essential goodness of this creation. After completing studies at Columbia University and N.Y.U., my big shift happened working at the Israeli Consulate in New York in the Press and Culture Depts. My heart found its home and I wanted nothing more than to align my destiny with the incredible people and the land of Israel. So I wrapped up my starter marriage and headed to Tel Aviv. Three years later, inspired by Israeli backpackers and Joseph Campbell, I decided to fully embrace my “heroʼs journey” and dedicate myself full-time to spiritual growth and soul adventure. I pressed on further East to magical India, where I was to meet my basherte, my soul mate, Rony. Raised in a secular Israeli family of Romanian restauranteurs, Rony’s first love was food. Upon graduating from Tadmor, Israelʼs Culinary Institute, he combined his passions for food and travel, honing his craft as a chef in London, New York, Atlanta and Tokyo. Eventually, his appetites turned to spirit and he sought nourishment in meditation and Buddhist practice. His quest brought him to India, where he sat for forty days and nights in Vipassana meditation, and then … he met me! He went to India seeking God, and came home with a Godess! Rony eventually encountered the richness of his own faith thanks to the hospitality and warm hearts of a Chabad rabbi in Hong Kong and his wife, and he returned to Israel to expand his knowledge of the Jewish tradition. After a year studying in yeshiva in Safed and beginning married life, we knew we had found our spiritual home. Since settling in Safed in 1996 we have immersed ourselves in the teachings and practices of the ancient mystics who once lived here. We have been blessed with three lovely children, two dogs, one boutique hotel and lots of lovely guests. It was love at first sight when we saw the graceful lines and stunning architecture of the house. 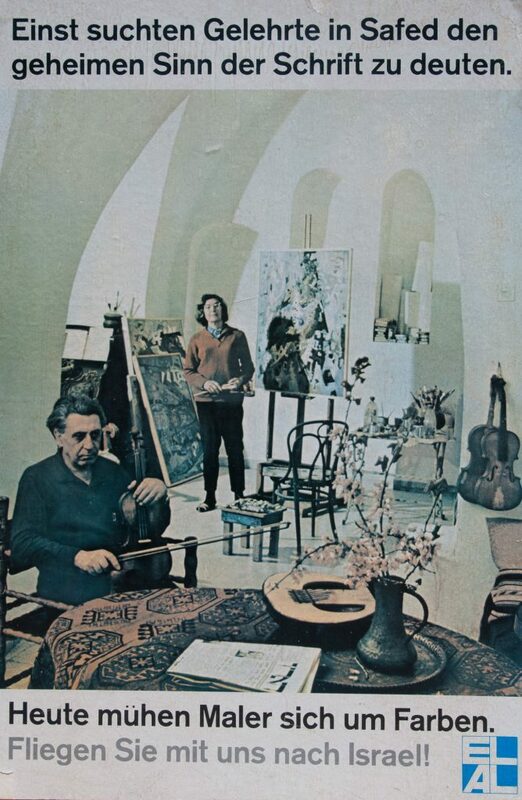 Once the home of famed writer Benjamin Tammuz and later the artist Hannah Levi, this historic stone house was chosen to represent the city of Safed* on posters for El Al Israel Airlines. Rony spent a year to renovating the house himself, adding “kablan” (contractor) to his resume. Shortly after moving in, we were hosting groups for gourmet meals prepared by Chef Rony. We have so enjoyed welcoming travelers from around the world, and people of all faiths, into our home. We have had the honor of hosting Cardinals and Chief Rabbis, Attorney Generals and Police chiefs, Congressmen and Torah scholars. The most memorable guest was our third child who was born at home just fifteen minutes before a group of forty women arrived for dinner! 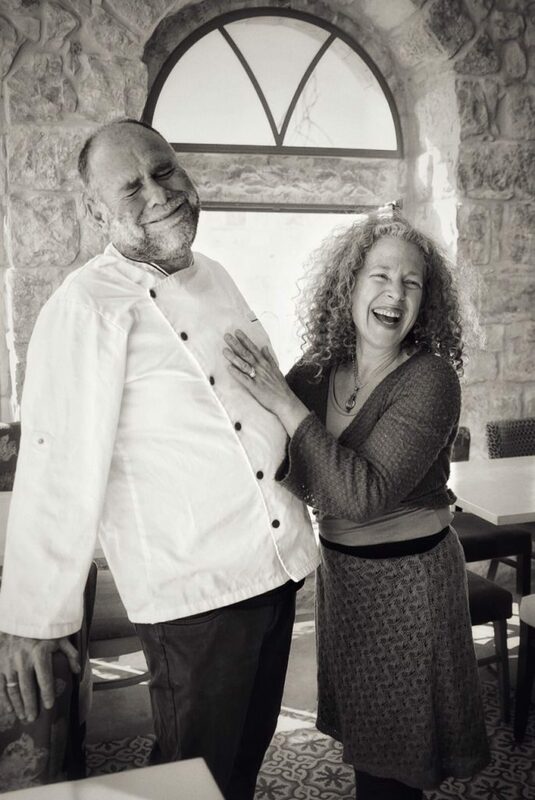 At that point we understood it was time to separate our home from our business … so we moved to Rosh Pina and began planning to create a hotel from the three properties we had acquired in Safed. Five years of planning and two years of renovation followed. 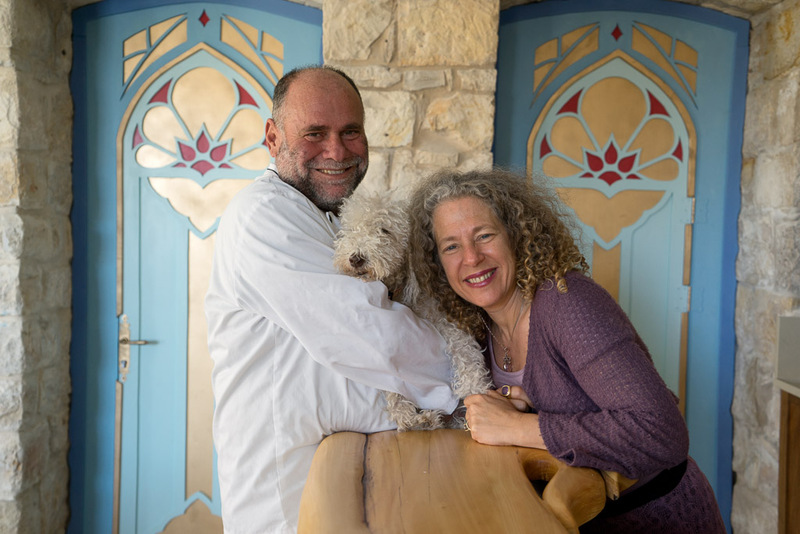 We want to give special thanks to our neighbors Rivka and Robert Baser, incredible artists who were founding members of the Artists’ Colony of Safed and whose home and gallery are now part of The Way Inn. Deep gratitude to our parents, Ruth, Emmanuel, Hannah and David, for their invaluable support and to our patient and wise architect Dubi Witt. Creating this hotel was a labor of love. We commissioned many artists and craftsmen to make every detail unique and we hope that you will enjoy their creativity and our vision. * also known as Tzfat, Tsfat, Zefat, Tzefat, Zefad, Safad.